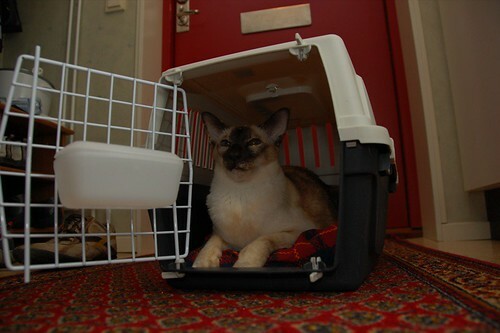 Boxed cat - Joakim A.
I was supposed to take the old female cat to the vet today. As you can see above she really likes the travel box! Unfortunately she seems to be allergic to dust and she gets this horrible slime cough from time to time. I’ve been to the vet before and there isn’t really that much they can do except give her a shot of cortisone. That makes wonders though! According to the vet the shot should last a few weeks but on her it seems to last 3-4 months. Maybe it’s the placebo effect, I don’t know. All I know is that it makes the coughing go away and that’s a good thing. When we got to the vet it turned out that he was on vacation so we’ll have to do the trip again next week. She doesn’t really mind going in the car though and as a bonus she hasn’t coughed all evening. Maybe it’s the car trip that is the real medicine!